Last summer we held a short bootcamp crash course for Gecko. The talks have been posted to air.mozilla.com and collected under the TorontoBootcamp tag. The talks are about an hour each but will be very informative to some. They are aimed at people wanting a deeper understanding of Gecko. In the talks you’ll find my first talk covering an overall discussion of the pipeline, what stages run when and how to skip stages for better performance. Kannan’s talk discusses Baseline, our first tier JIT. Boris’ talk discusses Restyle and Reflow. Benoit Jacob’s talk discusses the graphics stack (Rasterization + Compositing + IPC layer) but sadly the camera is off center for the first half. 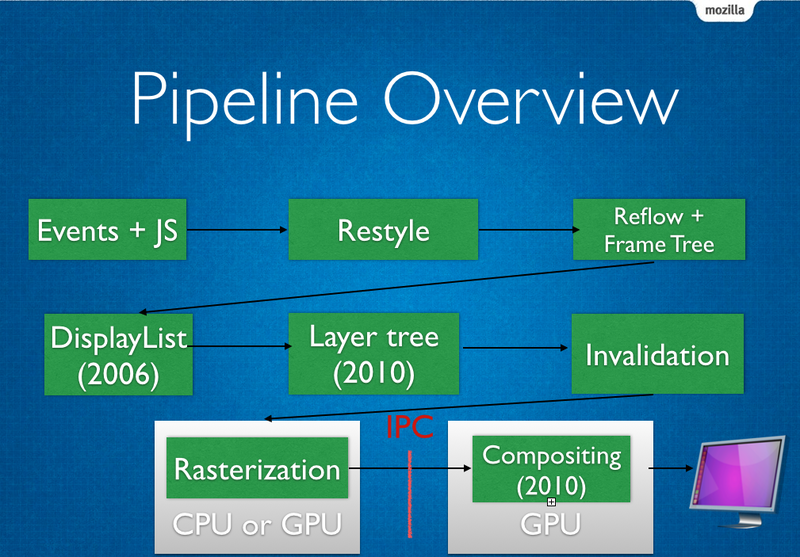 Jeff’s talk goes into depth into Rasterization, particularly path drawing. My second talk discusses performance analysis in Gecko using the gecko profiler where we look at real profiles of real performance problems. I’m trying to locate two more videos about layout and graphics that were given at another session but would elaborate more the DisplayList/Layer Tree/Invalidation phase and another on Compositing.